Recognised for its industry leading design and innovation, the Lusty EMS 19m Stag unique ability to unload both trailers without uncoupling, either in a jack-knife or straight line application, which allows quicker turnaround time resulting in increased productivity and ultimately greater revenue for your business. Designed to haul sand, gravel, grain and fertiliser the 19m Stag has side heights up to 6’ and can be specifically built to suit various prime mover sizes and haulage requirements. Optional rollover or retractable tarps are available to suit your load options and come in a choice of manual and electric operation. To maximise your payload advantage your Lusty EMS dealer can ensure that your truck and 19m Stag combination meets legal dimensional requirements. Designed to make your business more profitable with a low tare weight and high payload, Lusty EMS 19m Stag come with a two year warranty and are backed by a strong nationwide dealer network. Increasingly popular for grain and fertiliser haulage by offering lower tare weight over traditional B-Doubles. No need to roll the body or slide the suspension to unload the lead trailer. Ideal for bulk stockpiling or over grid haulage. Delivers extra mass carrying capacity over Body & Dog and greater flexibility for your prime mover by not being allocated to one type of work. 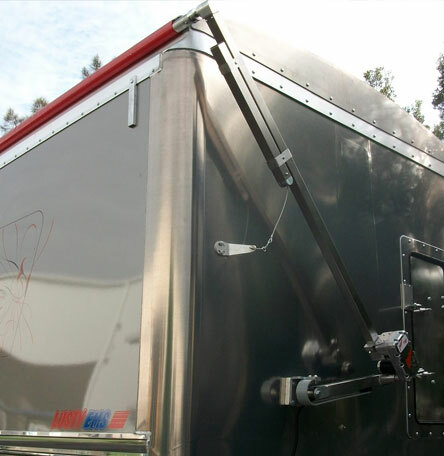 The patented hydraulic lift tailgate enables tipping in a straight line. 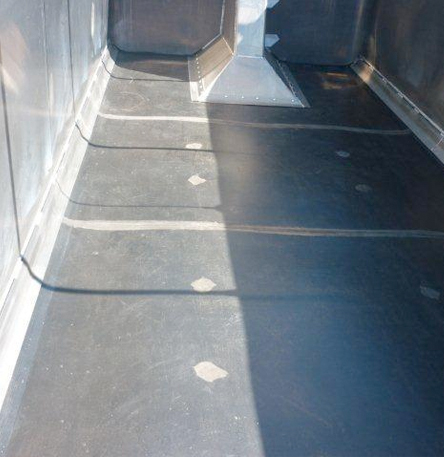 Rock sheeting and wear floors can also be fitted to help extend the service life of your trailer body. Quality wiring looms come as standard, which means reduced downtime and one less thing to worry about. Laser alignment of the chassis beams and suspensions provides for better stability and tracking which leads to reduced tyre wear. 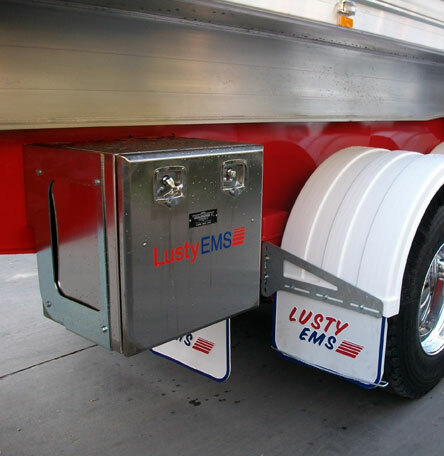 In the end, the Lusty EMS difference is obvious – our trailers are built with care and attention to detail to provide long and reliable life and strong resale value. Improving safety for operators is a major focus when Lusty EMS builds any trailer, to assist OH&S requirements and workers on-going safety when cleaning or inspecting the haulage bins, we have developed the Lusty EMS Access Door. The Access Door can be retro fitted to existing units or can be specified as an option when purchase a new unit. You can choose its placement on the trailer; it can be either fitted to the front or rear walls or either side wall depending on your requirement. MAXUS Mudguards and accessories come from original equipment heritage. 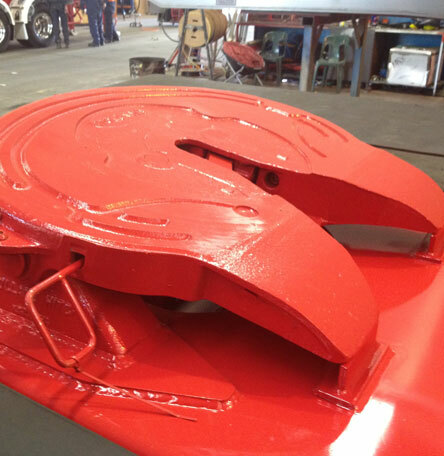 After a significant research and development program, the new MAXUS Mudguard and accessories range has been designed to meet the stringent requirements of Australia’s largest trailer building group. Quality, reliability and longevity are the cornerstones of all MAXUS products, with MAXUS Mudguards and Accessories leading the industry. The Maxus Mudguard doesn’t just look great, work and research has gone into making sure the materials used result in a premium, long lasting product. 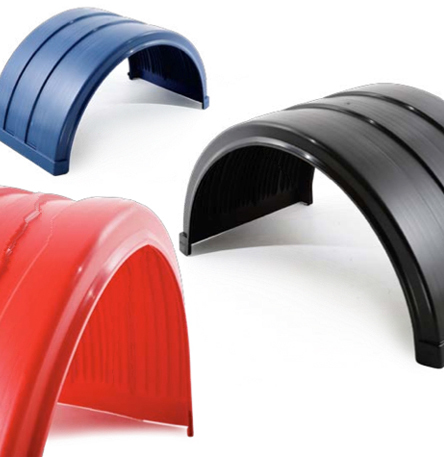 Why Choose MAXUS Mudguards and Accessories? The answer is simple “MAXUS - Quality that doesn’t cost the earth”. 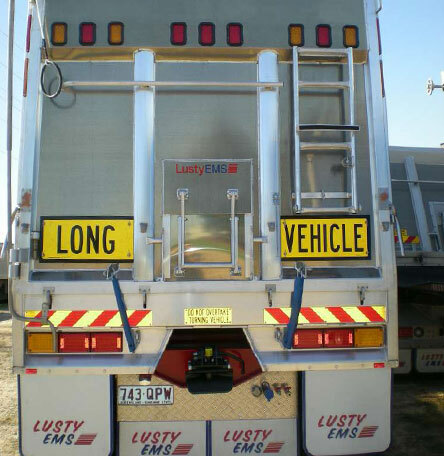 Please click here to view the Maxus Mudguards and accessories brochure available for Lusty EMS trailers. Protecting & improving your investment is what LustyEMS is all about. 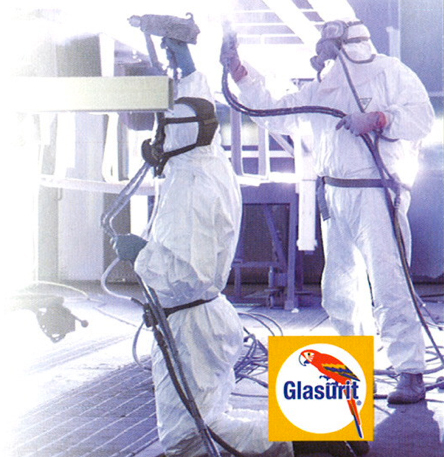 With the installation of Plaztuff polymer liner, you will eliminate any wear to your 6mm base aluminium floor. 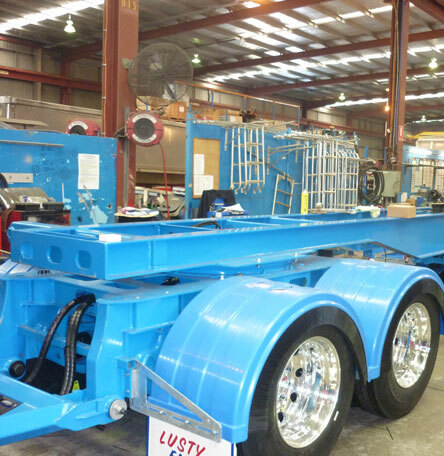 Safety for operators is a major focus when Lusty EMS builds any trailer. To enhance the OH&S requirements for your employees, the slick high-tech polymer liner will discharge even the stickiest loads from your tub. Sweeping out tubs will be a thing of the past. The Plaztuff™ can be retro fitted to existing units or can be specified as an option when purchasing a new unit. Installation consists of the Polymer sheet being welded together and brake pressed along the tub curve. There is also an aluminium cover strip along the top of the curve along with a hoist well which is also fastened to the floor (As shown). Please check back soon for information on our Tyre carriers. Please check back soon for more information about our Tarp options. 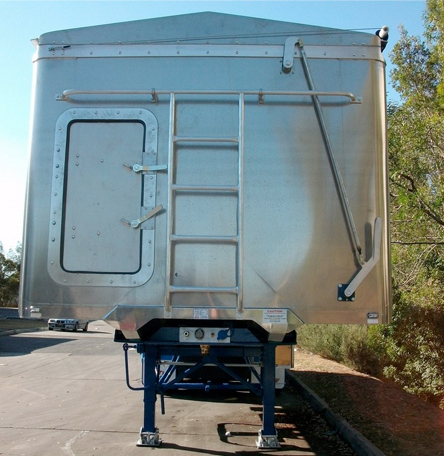 A range of tailgates is available to suit various trailers. 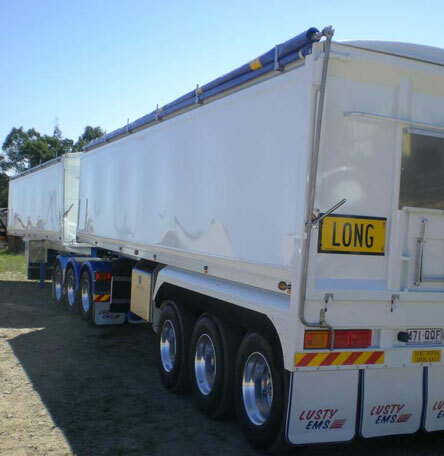 Enhance & protect your new investment by painting either the side sheets or fully including coaming rails etc, we can customize your trailers to suit your needs. 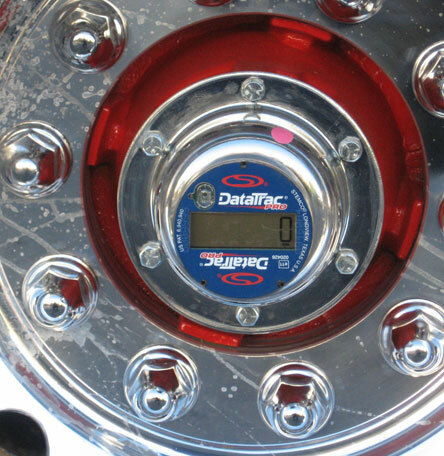 Load gauges help monitor the weight of the load your trailer is carrying which will help you achieve you maximum payloads and increased profits. Available in both analogue & digital versions and also now available in wireless versions. 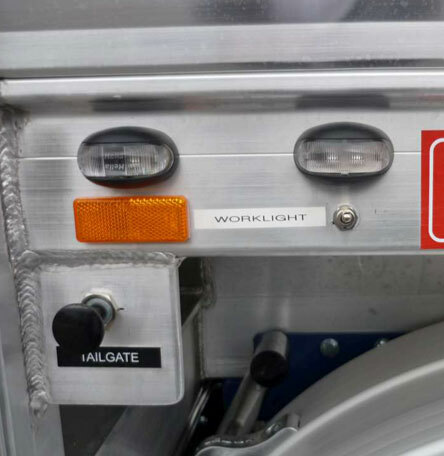 Further enhance the visibility of your new investment by fitting tailgate & rear post lamps to your trailer, we fit the leading brands of Led’s such as Hella & Narva to name a few, please speak to our team to discuss your requirements. Please check back soon for more information on our lighting options. A digital hub odometer records trailer kilometres for management of service programmes. Want even better load capacity on your trailers? 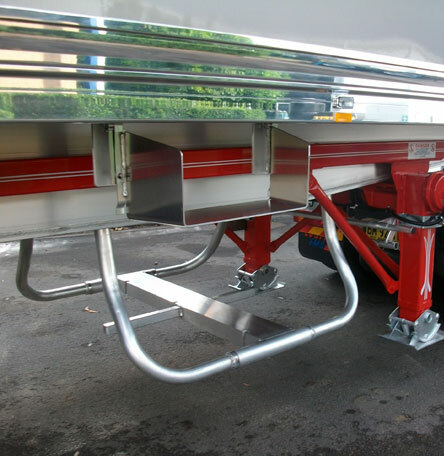 then the choice is simple, option the trailer with 700 grade high tensile steel used on the chassis, this option “will save you around 300-350kg per tri axle trailer (Chassis tipper/Slider/Rollback & Stag) & 200kg on a Tandem group trailer. 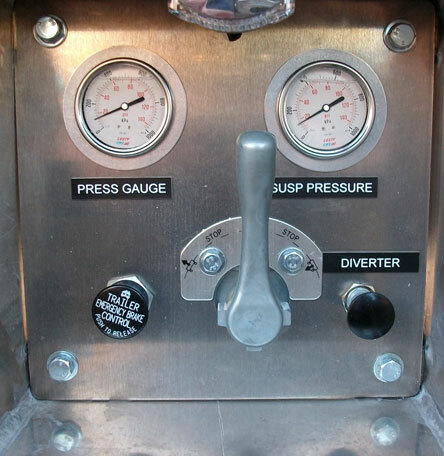 # Please note this option cannot be used on a TOA trailer.